Preheat oven to 375 degrees. Slice cinnamon bread into thick cubes. Whisk eggs, milk, vanilla, and salt in medium bowl. Crush corn flakes into separate bowl. Dip bread cubes in milk mixture. Roll in corn flakes. Place on greased cookie sheet. Bake 10-15 minutes, until bread is crispy. Place 3 cubes on skewer. 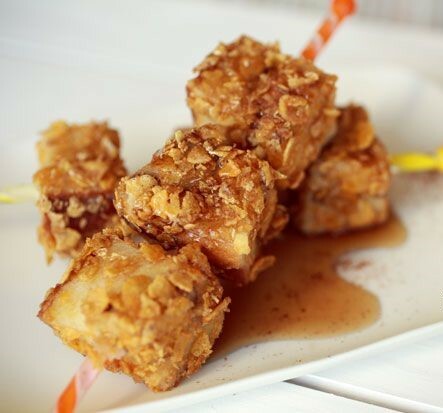 Drizzle maple syrup over cubes. Serve and enjoy!